First post today is 12:30 p.m.. The Super Hi 5 has a carryover of $6,110.99. Nine races are on the card. With rain expected overnight into the morning, we’re expecting races to come off the turf. In the fifth, a starter allowance going 1 1/8 miles on the turf, #8 Seeing’n’believing (9-2) might well catch the setup she caught last out: an off-the-turf race decimated by scratches. Confronted with that arrangement three weeks back, she won by a dozen lengths. 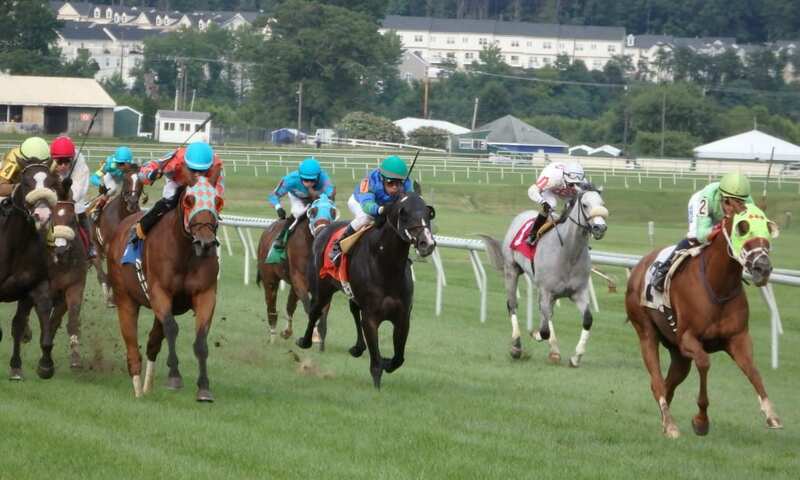 Here, she makes her first start in the King Leatherbury barn; Leatherbury claimed her for $15,000 out of that win, and this Sightseeing filly has repeatedly shown the ability to contend with these sorts on both dirt and turf. Darius Thorpe will ride. A wide open allowance sprint in race seven may give three lightly raced sorts the chance to get their careers back on track. #2 Showalter (3-1) has closed each of the last two years looking like a potential start but has been derailed by injuries; two years back, as a juvenile, he won at first asking and was sent off the favorite in the Maryland Juvenile Futurity but had a rough trip. Off 10 months, he returned late last year and in his second start, dusted allowance foes by almost five lengths. That was last October, and he hasn’t raced since. He’s been training well enough for trainer Gary Capuano, but you might want to take a wait-and-see attitude here; trainer Capuano is just 1-for-43 bringing horse off long layoffs in the last few years. Look for a useful return to give him something to build on. #4 Sounds the Horns (6-1), a pricey Include gelding, has won three of six but last out, against New York allowance rivals, got thumped. He’s had a bit of a good-bad sequence to his races and will look to get back on track after a two-month break. Alex Cintron is up for Graham Motion. And #7 High Roller (5-1) was another who showed early promise, winning the Frank Whiteley Stakes for newly minted sophomores back in January. He didn’t quite go forward from there, however, and hasn’t raced since April, when fifth in the Hilton Memorial at Charles Town. He’s been gelded in the interim and has fired four bullets in six recorded works for trainer Dale Capuano, who’s 10 percent off similar layoffs. Feargal Lynch will ride.